Sule Pagoda, built in the early 3rd century is a landmark in the city centre. 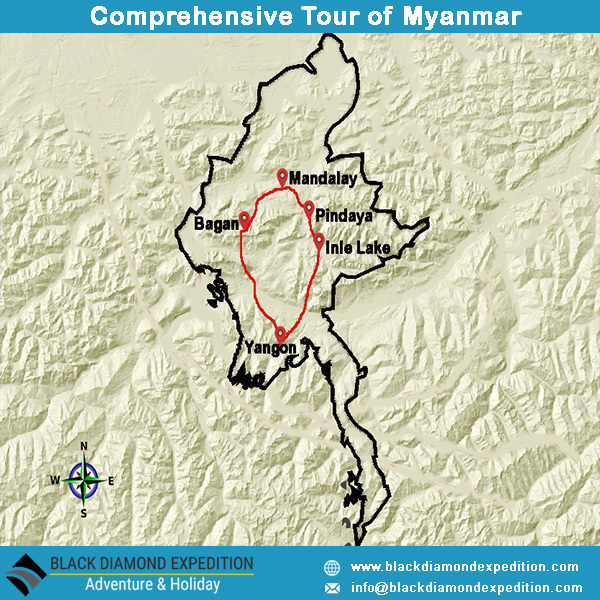 The Comprehensive tour of Myanmar is an adventure journey to the most amazing parts of Myanmar through Yangon, Mandalay, Bagan and the majestic Inle lake, where you will experience a captivating regions sustained by the lake beneath their stilted homes. Take a cruise on the Irrawaddy river to see the business of everyday life as you pass huts, villages and fishermen. 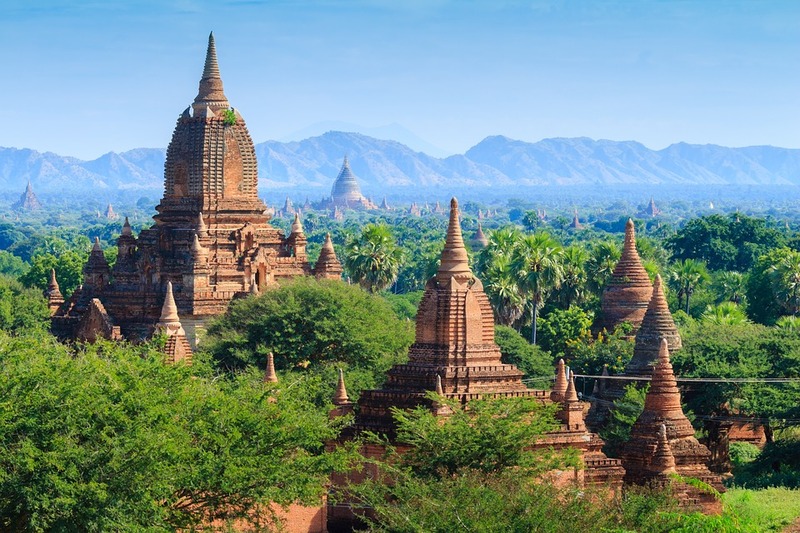 You will also explore the culture and religious spiritulity at Mandalay, the ancient royal capital of Amarapura, the longest wooden teak bridge, cruise along the Irrawaddy river, magnificent temples ancient structures in Bagan , temple caves, Inle lake , the lifestyle and culture of the Pa Oh tribe. You will visit the magnificent Shwedagon Pagoda, popularly known as one of Myanmar’s most sacred places. The colorful bell shaped stupa is gold-plated with the tip all set with diamonds and rubies, sapphires and topaz. When you see the Sun set on the Stupa, it reflects a stunning sight and you will definitely feel that Comprehnsive Tour of Myanmar is the most fitting place to begin your trip in this “Golden Land”. Sightseeing excursion around the Bagan Archaeological Zone, World Heritage Area provides you with a comprehensive exploration of Bagan. It also offers a visit to Shwezigon Pagoda, the prototype of later Myanmar stupas; Nyaung Oo market; Kyansittha Umin and the Wet-kyi-inn Gubyaukgyi Temple all showcasing the exquisite mural painting of 13th century and Htilominlo Temple. In the afternoon, continue to Manuha Temple built by exile King Manuha; Nanphaya, said to have been the residence of King Manuha; Ananda Temple, architectural masterpiece and Oak-Kyaung monastery decorated with multi colour mural paintings. Enjoy the breathtaking sunset from one of the temple of Bagan. Overnight at the hotel in Bagan. This morning, we will be watching sunrise over Bagan (optional) and back to hotel for breakfast. After breakfast at hotel, we head to Mt. Popa about 48 km south east of Bagan. Mt. Popa, known as the abode of Nats (spirits) - a collection of 37 magical spirits both feared and honoured by some Myanmar people and the nat museum, which houses 37 life-size nat statues sculpted from teak. It’s time to climb for 777 steps to the summit. Proceed to Popa Mountain Resort ( 1hr drive ) for our lunch. The restaurant offer a great view to the Popa summit that stands straight from the central plain. After lunch, return drive back to Bagan. On the way back, enroute stop at village cottage industry to learn the regional product as well as to watch the collection of juice from the palm trees, and its conversion to brown sugar. Overnight at the hotel in Bagan. wood carvings and enjoy the panoramic view of the city from Mandalay Hill. Overnight at the hotel. After breakfast, depart the hotel for flight to Heho on the Shan plateau. Upon arrival, transfer by road to Pindaya (60km) about 90 minutes drive. Make an excursion to the caves which houses over 8,000 Buddha Images of various sizes, made from teak, lacquer, marble, alabaster and cement. In the afternoon, explore the district for it’s famous traditional paper & umbrella making home base cottage industry. Drive to inle. Overnight In Inle. We plan to spend the day visiting villages and. You will see the unique method locals use to row their boats, fishermen with their own style of fishing, floating farms and gardens . You will visit Phaungdawoo Pagoda which houses the five most revered Buddha Images in the southern Shan State. Continue our excursion by motorized boat to Indein pagoda complex, in the south-west of the lake. The boat leaves the lake and enters a narrow canal with a beautiful natural environment to continue to a small Pa O tribe village. From the village, follow an old covered path to a 13th century monastery and the very impressive ruins of hundreds of ancient pagodas, some hidden in the vegetation. The main stupa-area on the top of the hill offers breathtaking views over the surrounding mountains and down to the valley and the lake in the far distance. Return to your hotel and overnight at the hotel. This morning, leave your hotel by boat and drive up through pine-clad hills to Taunggyi, capital of Southern Shan State and a former British hill station. Visit the local market where minority people sell their produce and a cheroot factory. Just a couple of hours from Taunggyi, discover the "long lost" ruins of Kak Ku in countryside inhabited by the Pa O people. Situated in the rolling Shan Hills, Kak Ku pagoda is very unusual and little is known about its origins. The Pa O people believe that the original pagoda was built on the site some 2,000 years ago. Dozens of small stupas surround the main pagoda in a huge circle. You can wander through the stupas which are decorated with fine stucco work and Buddha images. Visit one of the many Pa O villages near Kak Ku and see a huge monastery on the way back to Taunggyi. Transfer back to Nyaung Shwe where you will board your boat return to your hotel. Check in at airport and fly back to Yangon. Upon arrival, check in at hotel. In the afternoon, we plan to visit by car to Karaweik, a royal barge for fantastic photo shot along the “pilgrims” causeway across the Royal Lake with stunning views of Schwedagon Pagoda and visit the Bogyoke Aung San Market (Scott Market) for souvenir shopping. Overnight at the hotel in Yangon.